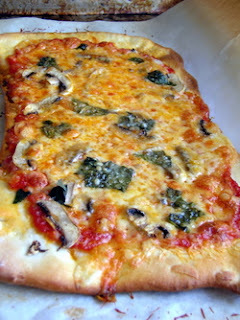 Note: Here's the original pizza dough recipe and the recipe for the Three-Cheese Pizza with Pancetta and Mushroom Pizza. I omitted the pancetta and made my own marinara sauce. In a saucepan, heat the olive oil and add the onions, garlic and red pepper flakes. Saute over medium heat until the onions and garlic soften, about 5 minutes. Add the tomato puree and bring to a boil. Season with salt and pepper. Simmer the sauce until it has thickened slightly, about 5 minutes. Remove the sauce from the heat and let cool for about 10 minutes. While the sauce is cooling, preheat your oven to 475 degrees F.
Divide the pizza dough into two and shape each half into a rectangle that's roughly about 13 x 8 inches. The dough will be very thin. Transfer the dough to two baking sheets lined with parchment paper. Divide the sauce between the two pizzas spreading it evenly but leaving a border of about an inch all the way around. Sprinkle the fontina, mozzarella and parmigiano reggiano evenly over the two pizzas. Sprinkle the mushrooms evenly over the cheese. Divide the torn basil and sprinkle evenly over the two pizzas. Bake the pizzas for about 20 minutes, or until they are golden brown and the cheese has melted and is very bubbly. Remove from the oven and let the pizzas cool for a minute or two before slicing and serving.